Aster Pompon White Callistephus Chinensis is a very showy annual garden flower that is grown from aster seeds. This China Pompon selection blooms with charming, extra-large, pure-white flowers on tall, sturdy floral stems. The aster flowers resemble pompons and bloom from summer until last frost. The fragrant blooms attract masses of butterflies and bees. 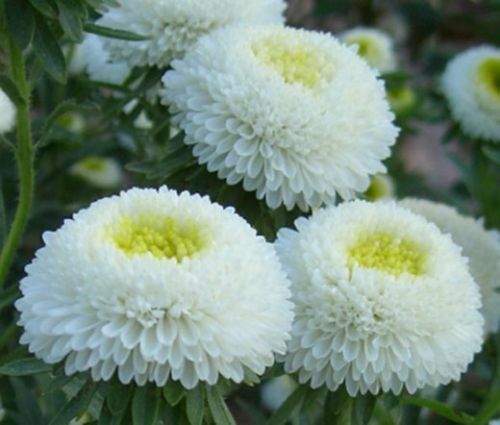 Aster Pompon White is a highly desirable flowering plant for any garden. Because of its tall, strong stems and appealing flowers Pompon Aster is widely grown in cutting gardens, flower beds, borders, and containers. Callistephus Chinensis favors full or partial sun and moist well-drained soil. This long-lasting cut flower looks fabulous in floral arrangements.